Lady Fiona Carnarvon became the chatelaine of Highclere Castle - the setting of the hit series Downton Abbey - eight years ago. In that time she's become fascinated by the rich history of Highclere, and by the extraordinary people who lived there over the centuries. One person particularly captured Fiona's imagination - Lady Almina, the 5th Countess of Carnarvon. Almina was the illegitimate daughter of banking tycoon Alfred de Rothschild. She was his only daughter and he doted on her. She married George, the Earl of Carnarvon, at 19 with an enormous dowry. At first, life at Highclere was a dizzying mix of sumptuous banquets for 500 and even the occasional royal visitor. Almina oversaw 80 members of staff - many of whom came from families who had worked at Highclere for generations. But when the First World War broke out, life at Highclere changed forever. History intervened and Almina and the staff of Highclere were thrown into one of the most turbulent times of the last century. Almina was forced to draw on her deepest reserves of courage in order to ensure her family, the staff and the castle survived. This is the remarkable story of a lost time. But Highclere remains and in this book, Fiona weaves Almina's journey into the heritage and history of one of England's most exquisite Victorian castles. Like most people who have read this book, I only did it because of Downton Abbey, which I adore. It’s horrendous and I love it. The author, the current Countess of Carnarvon, plays up the Downton Abbey connection, but rather than giving an entire historic timeline of Highclere, she focuses in on the turn of the century and Lady Almina, the 5th Countess of Carnarvon. I know the book is called “The Lost Legacy of Highclere Castle”, but not a whole lot of it actually happens at Highclere. A lot of the action actually goes down in London and Egypt. The book also goes into detail on Lord Carnarvon’s excavations in Egypt, the hospital in London, and the action on the battlefields. There is an awful lot of history, but I found it a really interesting way to learn about the Victorian and Edwardian era and the First World War. So rather than the castle becoming the focal point of the book, the story revolves around Lady Almina and her family. I feel like the author feels a certain kinship to Almina, given that they both married into the Carnarvon family, both having to adapt to the new lifestyle that comes with the title, so there is probably a personal bias there. 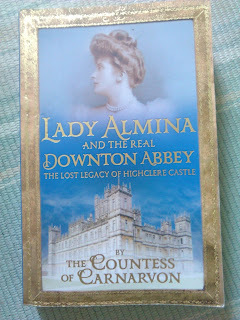 As I was reading I couldn’t help but notice some serious parallels between Almina’s life and the plot of Downton Abbey, which made me wonder whether Fellowes sought inspiration for his series from the history of the castle itself. To me, this just means that anyone like me who is reading this book because they love the series, will really enjoy it. The book is written in third person, and really reminded me of the style of Mrs. Robinson’s Disgrace by Kate Summerscale. Both books are based on real events and references letters, records and documents. However , the Countess of Carnarvon seems to have been a bit more liberal in her interpretation of the events than Summerscale ever was, giving accounts and descriptions of the “characters” opinions and emotions. Unless of course she has all this is recorded in letters and diaries, but it all seem a bit speculative to me. Overall, this is a really great book that any fan of Downton Abbey would enjoy.